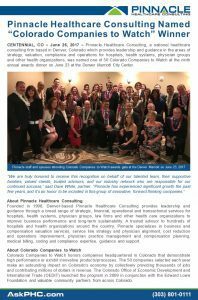 Pinnacle Healthcare Consulting was Named One of 50 Colorado Companies to Watch at the Ninth Annual Awards Dinner on June 23 at the Denver Marriott City Center! 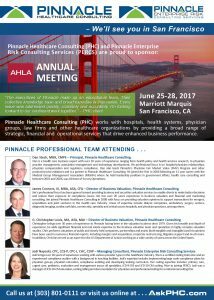 Pinnacle Healthcare Consulting (PHC) and Pinnacle Enterprise Risk Consulting Services (PERCS) are Proud to Sponsor the AHLA Annual Meeting in San Francisco on June 25-28, 2017 at Marriott Marquis. 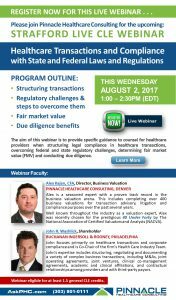 Please Stop by Our Booth to Meet Our Team Members and Learn More About Our Services! 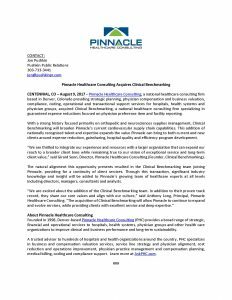 Pinnacle Healthcare Consulting was quoted in The Ambulatory M&A Advisor article regarding quality metrics.